Hypuronector is a genus of extinct reptile from the Triassic Period that lived in what is now New Jersey. The etymology of the name translates as "deep-tailed swimmer from the lake." A member of the Simiosauria, Hypuronector is related to the arboreal Megalancosaurus. It was a small animal, estimated to be only 12 cm long in life. So far dozens of specimens of Hypuronector are known, but despite this, scientists have not found any complete skeletons. This makes attempts to reconstruct Hypuronector's body or lifestyle highly speculative and controversial. 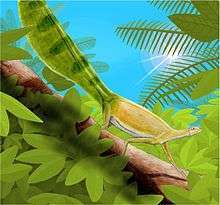 Despite their evolutionary relationship, it has been suggested by some scientists that Hypuronector may have had a different ecological niche than other drepanosaurs. It has long been accepted that Megalancosaurus was an arboreal chameleon-like animal. Hypuronector has inversely been suggested to be aquatic due to its deep, paddle-like tail and the fact that its remains were found in an ancient lake bottom. However, several studies on its limb morphology, as well as the rather delicate tail vertebrae without evidence of extensive caudal musculature, rule out an aquatic hypothesis, and it was likely arboreal like other drepanosaurs. Perhaps more extremely, it has been suggested to be a glider or flyer, due to the limb proportions, particularly the elongated forelimbs. These are consistent with an animal with patagia, like a flying squirrel. 1 2 Renesto, S., Spielmann, J. A., Lucas, S. G., & Spagnoli, G. T. (2010). The taxonomy and paleobiology of the Late Triassic (Carnian-Norian: Adamanian-Apachean) drepanosaurs (Diapsida: Archosauromorpha: Drepanosauromorpha): Bulletin 46 (Vol. 46). New Mexico Museum of Natural History and Science.